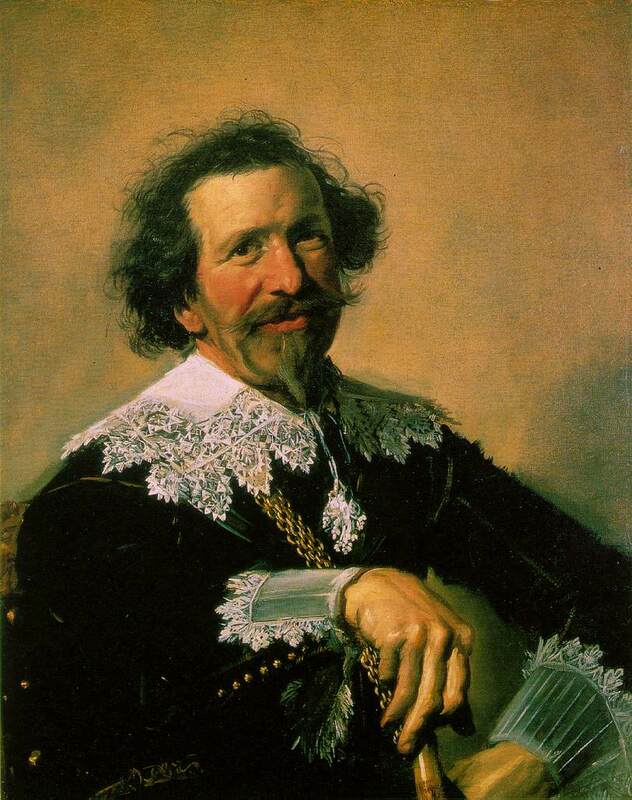 Hals, Frans (1582/3 - 1666). Dutch painter. He was born in Antwerp, the son of Flemish parents who moved to Holland after the city fell to the Spaniards in 1585. His parents had settled in Haarlem by 1591 and he spent his long life there. He was twice married, had at least ten childred, and was constantly in financial trouble. Houbraken says he was `filled to the girls every evening', but there is no real foundation for the popular image of him as a drunken wife-beater. His second wife, however, was more than once in trouble for brawling. During his last years he was destitute and the municipal authorities of Haarlem awarded him a small annuan stipend four years before his death. Hals was the first great artist of the 17th-century Dutch school and is regarded as one of the most brilliant of all portraitists. Almost all his works are portraits and even those that are not (some genre scenes, and an occasional religious picture) are portrait-like in character. He is said to have been taught in Haarlem by Karel van Mander, but there is no discernible influence from him in Hals's early works, which are not numerous or well documented. The earliest extant picture is the fragment of a portrait Jacobus Zaffius (Hals Museum, Haarlem, 1611), and upon the basis of stylistic evidence one or two paintings can be dated a year or so earlier. Nothing he did before 1616 suggested that he would shatter well-established traditions with his life-size group portrait The Banquet of the Officers of the St George Militia Company (Hals Museum) painted during that year. There is no precedent in either his own work or that of his predecessors for the vigorous composition and characterization of this picture, which has become a symbol of the strength and healthy optimism of the men who established the new Dutch Republic. It demonstrates to the full his remarkable ability -- his greatest gift as a portraitist -- to capture a sense of fleeting movement and expression and thereby convey a compelling feeling of vivacity. From 1616 onwards there is no shortage of dated or documented works and his artistic development is clear. He was at the height of his popularity in the 1620s and 1630s. 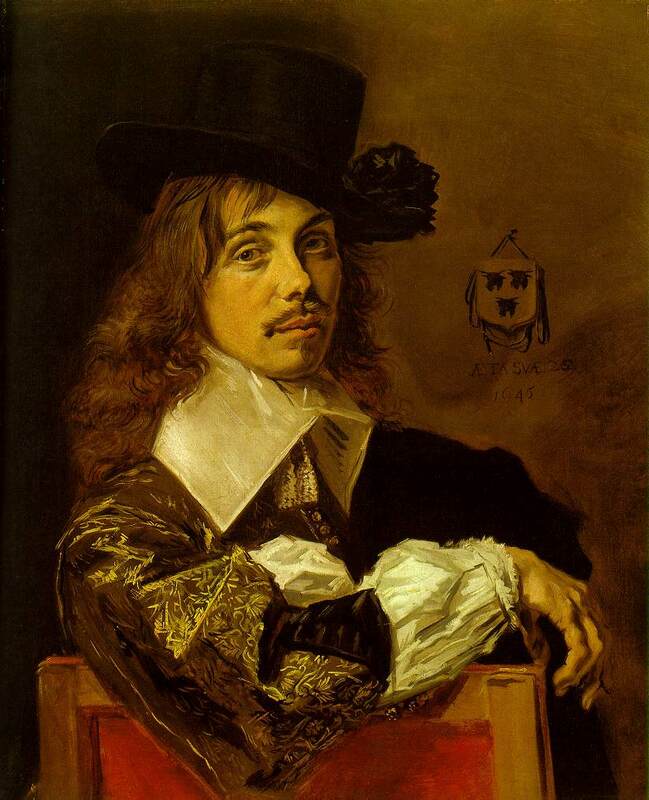 During these decades he made five large group portraits of civil guards; one is in the Rijksmuseum and the others are in the Frans Hals Museum, Haarlem, the only place where one can get a comprehensive view of his range and power. In the 1630s his compositions became simpler and monochromatic effects took the place of the bright colors of the earlier paintings ( Lucas de Clercq and Feyntje van Steenkiste , Rijksmuseum, Amsterdam, 1635). The group portrait of the Regents of the St Elizabeth Hospital (Hals Museum, 1641) sets the key for the sober restraint of the late period, when his pictures became darker and his brush-strokes more economical. The culmination of this phase -- indeed of his entire career -- are his group portraits of the Regents and the Regentesses of the Old Men's Alms House (Hals Museum, c. 1664), which rank among the most moving portraits ever painted. By this time Hals was using in his commissioned portraits the bold brushwork and the alla prima technique which early in his career he reserved for genre pictures. No drawings by him are known and he presumably worked straight on to the canvas. Hals had two painter brothers and five painter sons, but the only artist of substance among them was his brother Dirk (1591-1656), who painted charming small interior scenes. Apart from his sons, Hals taught numerous pupils, including (with varying degrees of certainty) Judith Leyster, Jan Miense Molenaer, Adriaen van Ostade, Adriaen Brouwer, and Philips Wouwerman. His reputation did not long outlive him, however, and with rare exceptions -- Reynolds was one of them -- few critics before 1850 praised him. It was only in the second half of the 19th century that there was a renewed appreciation of his genius. The spontaneity of his work appealed to the generation of the Impressionists, and from about 1870 to about 1920 he was one of the most popular of the Old Masters, becoming a model for society portraitists. 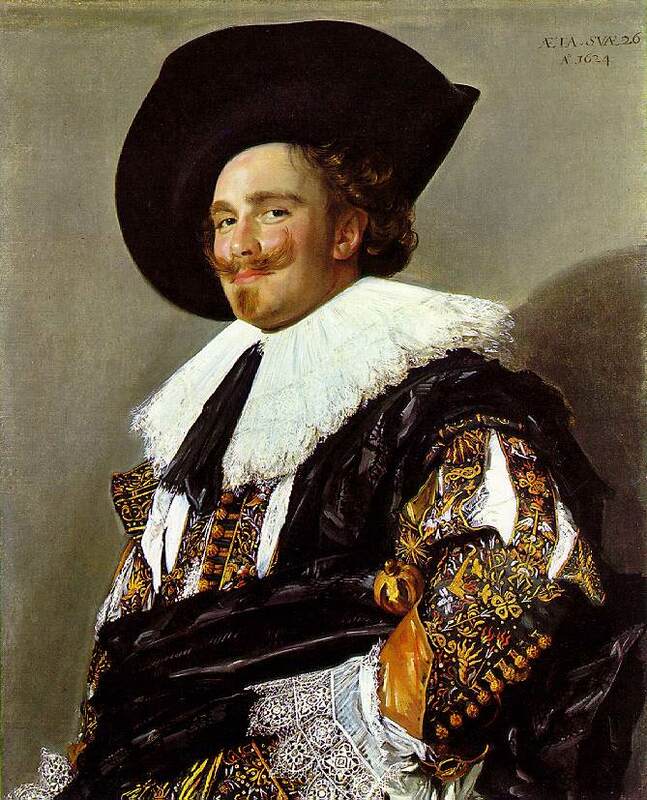 Lord Hertford's purchase of his most famous work, The Laughing Cavalier (Wallace Collection, London, 1624), for the then enormous sum of 51,000 francs in 1865, was a milestone in the revival of his fortunes, and the buoyant confidence of his paintings later made him a particular favorite with the new generation of fabulously rich American collectors -- self-made men -- who were beginning to dominate the picture market. This explains why so many works by him are in American collections.